I started the charcoal today. 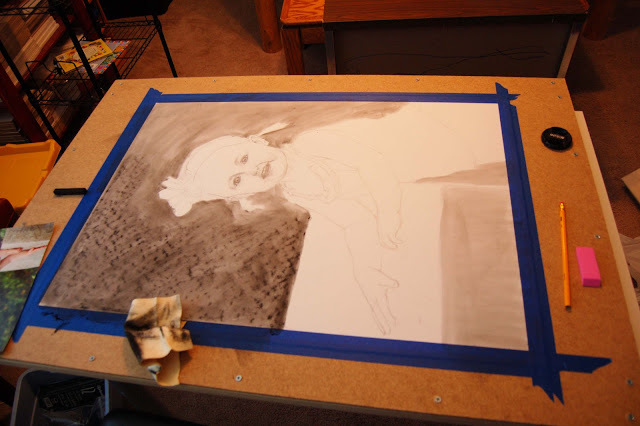 I have to get this done next week so I'm putting in a lot of time this week. I had a good 6 hour session with only the occasional interruption from Logan. I've set up a drawing/coloring station for him next to me. This has been great for those moments when he just wants to be near me. He wanders in, checks out what I'm doing then follows my lead and draws. It's been really quite fun for us. Anyway, I'm trying to contain all the charcoal as best I can since my studio is in my bedroom. That's why I've laid down the piece instead of standing it up. 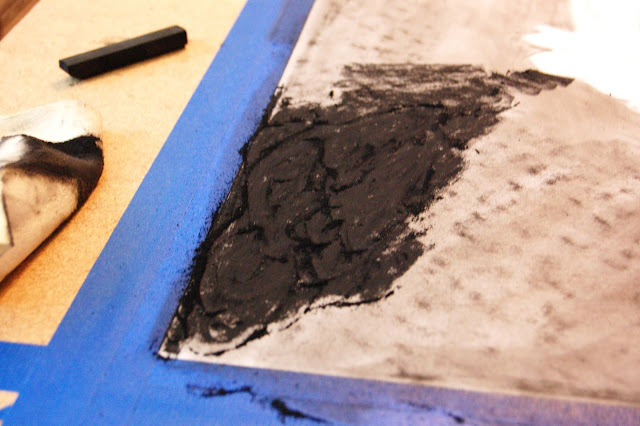 Applying charcoal is messy business! 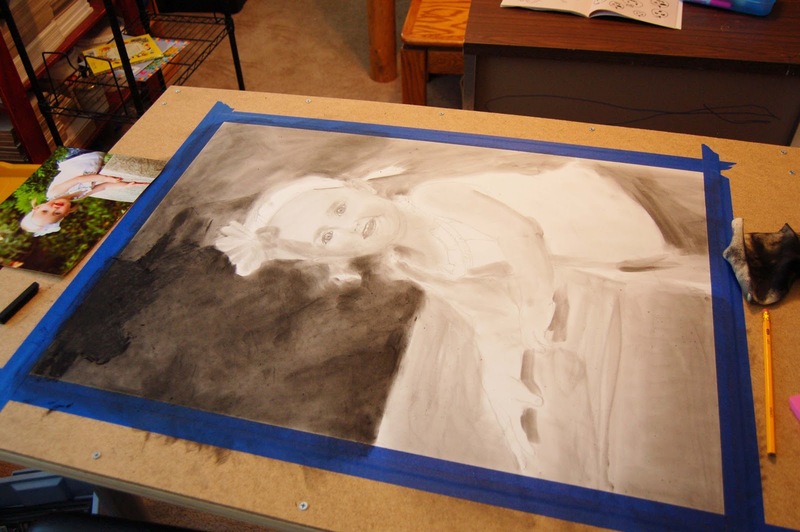 I first block in my dark areas with a stick of compressed charcoal. This board creates a super distinct pattern so I'll only use the stick on the areas where there is foliage. I then create my "pool" of charcoal. 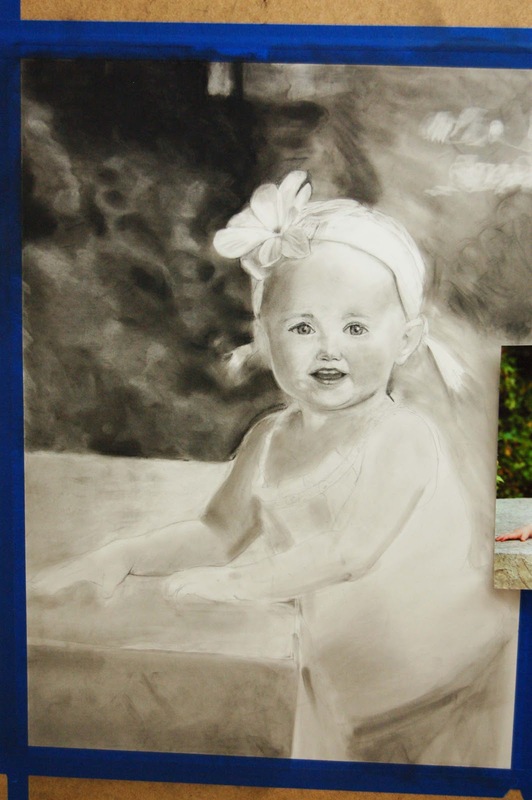 Compressed charcoal is harsh and very unforgiving. I only use it on areas I know are dark-dark. I like to keep all the charcoal dust and marks contained to the darkest of parts. 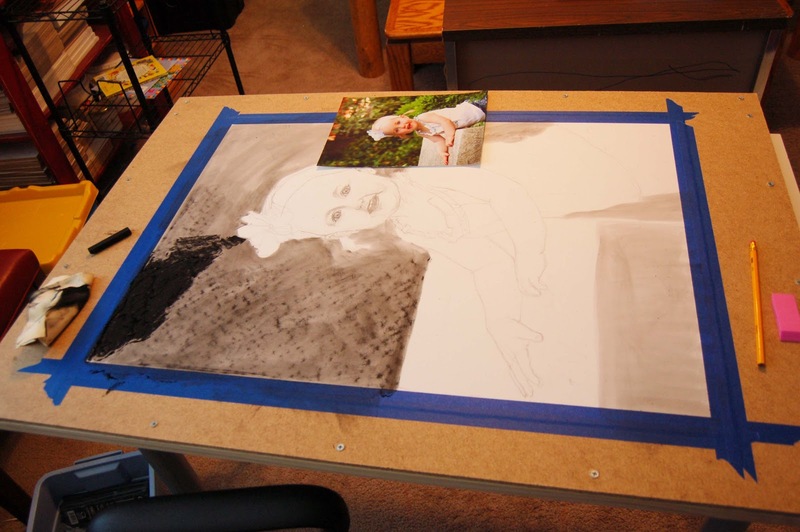 I use this pool throughout the drawing, dipping my finger or a soft leather cloth and spreading where I need it. I block in all general areas. I carefully block in all the paper; reserving my "lights." I don't like to use white charcoal. I'd rather use the white of the paper to create a full-range of value. I stopped here at hour 6. I just knew I needed a break. I have a good chunk of time tomorrow while Logan is at school to continue. Once I capture her face again the rest will come smoothly as I tighten everything up. I'm feeling good about having this done in time. I always feel great after a working on something that is 2 inches away from my face then stepping back and seeing it come together.